If the U.S. is to remain competitive, it must take a close look at what’s happening abroad. We are seeing a rapid increase in opportunities to plan, design, and construct corporate and academic projects with a focus on science and technology in developing countries throughout the Middle East and Asia. Countries such as China, India, Singapore, and Saudi Arabia have had underdeveloped infrastructure and are now growing at much higher rates than developed countries. Just recently, during the 2008 Olympics, the world was able to see the significant development that has been taking place in China over the last decade. Many articles and books have been written about this phenomenon, most notably Thomas Friedman’s The World Is Flat and Hot, Flat, and Crowded. Much of this literature has focused on the growth and competitiveness that is evolving around the world. These developing countries can benefit from the lessons learned over the last 50 years in Europe and North America, and their opportunities lie in advancing technology, which should be a priority globally.?? As Asian economies mature, they’re finding new specialties. Research is being conducted at a very high level around the world. Initially, developing countries were focusing on basic science and technology research. However, as they mature, they are choosing additional areas of specialization. 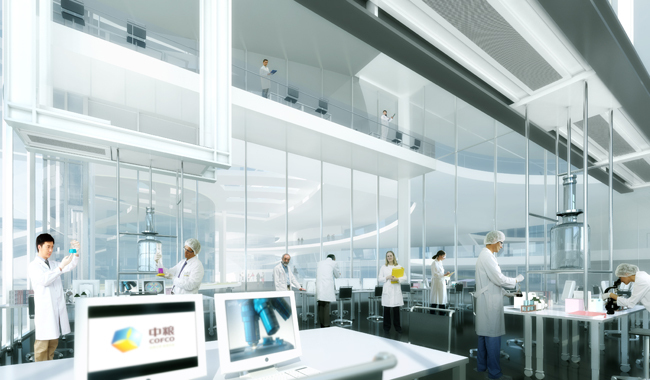 For example, Singapore is focusing on biological sciences research, with an emphasis on stem-cell and cancer research. China is addressing sustainable technology research. Knowledge and research is usually for the global good, and therefore any research discovery anywhere can help all people everywhere. Fewer regulations in many developing countries have the potential of accelerating these research discoveries. Research is becoming increasingly important to enable the advances in health care and technologies necessary to address global stresses from population growth, longer life expectancy, demands on limited resources, and environmental degradation. Basic science research discoveries, inventions, and better education have already led to increased life expectancy. At the beginning of the 19th century, the average life expectancy was approximately 24 years. At the beginning of the 21st century, the life expectancy in developed countries rose to 78 years, a steady average increase of three months a year over the past 200 years. Some key research discoveries from 1800 to 2000 include the first vaccination (1796), first blood transfusion (1818), the development of anesthetics (1847), X-rays (1895), the introduction of aspirin (1898) and penicillin (1928), the computer (1938), the development of vaccines for polio, tuberculosis, mumps, and rubella (1952), and the development of the MRI (1977). What does this mean? Quite simply, if the average life expectancy continues to increase at the same rate, then by the beginning of the 22nd century, people will be averaging 100 years of age and older! 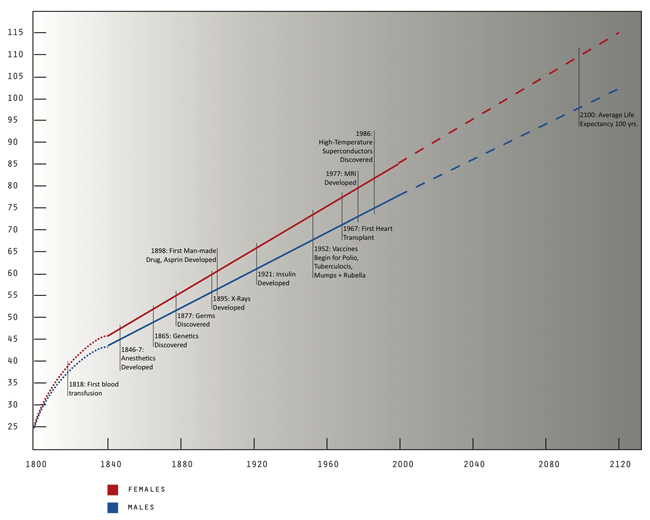 Currently, the average life expectancy is 20 to 30 years less in developing countries. The hope and expectation is that during the 21st century developing countries will catch up. This could happen by continued education, further global partnerships, economic growth, as well as new research discoveries.? Domestic research institutions in the U.S. have the opportunity to learn from what is expected to be international success stories. Moving forward, it will be important that the U.S. becomes more efficient and innovative to have a chance to keep up with change and global competition. Without being bogged down with layers of hierarchy, the governments and companies of developing international countries can make decisions faster and implement them very quickly, thus building team leaders who are able to make decisions more rapidly. The clients in these developing countries are not as burdened with internal politics, out-of-date standards, or people who are making the same decisions they have for decades. In the U.S., we see more expensive buildings because of requirements by health and safety regulations, various code officials, local municipalities, and vested interested groups. Each group requires something, which usually means more cost and complications. Simply too many review agencies and individuals have a say on specific issues but have very little interest in the overall success of the project. Developing countries, such as China and India, have large populations with high development growth rates; while the Middle Eastern countries have the economic means to build significant infrastructure projects to support their populations. Additionally, countries like Saudi Arabia, Singapore, and China are able to skip a generation of learning by investing in the benefits of sustainable buildings. The latest and best equipment is being purchased at hospitals, research centers, and academic facilities. Buildings are designed to change quickly to accommodate growth as these countries develop at a rapid pace. Drawing up campus master plans and designing several buildings at one time create ideal solutions for the long term. There is no burden for working on existing campuses that have significant limitations and growth problems as seen in the U.S. and Europe. As soon as decisions are finalized and funded overseas, the projects are expected to be built as soon as possible.?? Many of these developing countries do not have a deep supply chain of materials. Supplies are delivered on a daily basis, which improves efficiencies. In these countries, people do not use expensive buildings to store more than seven days of supplies. Additionally, storage happens in facilities in close vicinity to the main buildings. For example, universities in the Middle East and Asia have separate campuses of several warehouse buildings nearby. In contrast, the U.S. uses much space for unnecessary and inefficient storage. U.S. universities, for example, have separate funding for construction and operations. Cost is not addressed in a holistic manner, like it is in many developing countries. The “just in time” management of supplies is clearly a better business model. Facilities in the developing world are much more cost-effective to run, support safer buildings, and the supplies are delivered in most cases upon request within seven days. The U.S. and Europe should consider a similar model and find ways to be much more cost-effective in the use of expensive buildings and providing supplies in a timely manner as it will be a significant shift and potentially contribute to large savings. International projects for developing countries have the opportunity to utilize the sustainable initiatives developed by the U.S. and Europe as their baselines in building new facilities, and they should look for greater energy-efficient solutions and expect their staffs to run them in such an effective manner. Developing countries can utilize sustainability as the baseline for development. They are able to take on new sustainable initiatives being developed because they do not have the infrastructure to run their facilities. The sustainable design starts at the campus and sometimes town level, then continues throughout all aspects of the community and building development.?? The U.S. may be evolving into the next Europe. The U.S. may be evolving into the next Europe. Europe used to lead the world in research for many decades until the end of World War II. Many top scientists moved from Europe to the U.S. in the 1940s, and the U.S. focused on research to support growth within the country. To maintain that competitive edge, the U.S. needs to examine sustainable models in cities and buildings and evaluate them as better business models than the existing system. The U.S. needs to think out of the box to make timely, big-picture decisions, use its current infrastructure more effectively, and become a more efficient and less wasteful country. The U.S. has had the luxury of growing abroad with multinational companies and universities that have very strong global brand recognition. We will start to see companies from developing countries evolve and become very competitive in most areas of the world as well. Those countries will be expanding their brands around the world over the next 20 years, just as Europe and the U.S. have done over the past 20 years. The best ideas and professionals are anywhere and everywhere. Keeping up with change and innovation may be the most difficult aspect of our work in the 21st century. While the growth clearly will be happening much more in developing countries, this growth of innovation in research and the knowledge industry can benefit the entire world. Dan Watch is the global market sector leader for the Science & Technology sector of Perkins+Will. He has worked on nine major international research and health care projects in the last four years. He is specializing and working on projects in the United States, the Middle East, and Asia. With a focus on designing state-of-the-art research facilities, he witnesses firsthand how innovation plays a key role in the development of complex buildings like research facilities, hospitals, and academic structures. He has written three books, the most recent titled Research for the Global Good. Russ Drinker is the regional director for Asia of Perkins+Will in San Francisco, providing leadership on a broad range of large-scale, innovative, and technically challenging projects with an emphasis on sustainable design. His international work includes the Campus for Research Excellence and Technological Enterprise (CREATE) project for the National Research Foundation in Singapore and the Princess Noura University project in Riyadh, Saudi Arabia.